Designed as a no-compromise integrated vacuum tube amplifier, the Reflection MK2 is a best in class work of art and engineering. "Plenty of power and flexibility"
"After getting accustomed to the Raven Reflection, other amps sounded decidedly polite and timid. Can an amp be “too dramatic” or “too powerful” sounding? I don’t see how it’s possible to create artificial drama without resorting to EQ and dynamic expander circuits, both missing in the Reflection. My conclusion then, is that the Reflection is an excellent sounding integrated amp, with plenty of power and flexibility." 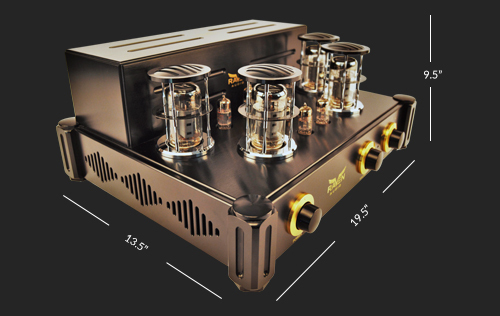 The Reflection takes everything we learned from creating the Silhouette MK2 Monoblock “Ultimate Tube Amplifier” and combines a world-class preamp for a best in class integrated tube amp. An extraordinarily fast response delivers well-defined clean midbass and articulate, tight, full-throated low bass. The highs have all the pristine detail one could imagine with a midrange that is pure liquid for an unprecedented listening experience at this price point. It is a statement piece, and will immediately become the center of your room! Capacitors have a significant impact on the sound of an amplifier. On tube amplifiers they are critical. This is why we manufacture our own capacitors. They are a cost-no-object design and are born out of our Elite series amplifiers engineering efforts. All of our Elite Series has audiophile grade RCA connectors. They are made of 99.95 percent oxygen free copper and are gold plated. Each heavy duty connector is individually hand soldered to oxygen free copper wire. The speaker binding post are also 99.95 percent oxygen free copper with gold plating. They accept banana, spade, and bare wire as large as 8 gauge. The Elite Series chassis are machined-from-solid-billet aerospace aluminum plates with solid-bronze corner posts. Construction is maintained with high-grade stainless-steel screws throughout. The adjustable chrome-plated stainless steel ball footers insulate and isolate the amplifiers and tubes for a better sonic response which is freer of conductive resonances, also good for avoiding scratches on your furniture.